January | 2013 | Wait... What? Open data should be part of the public’s right to information, not a service that government can decide whether to provide or not. 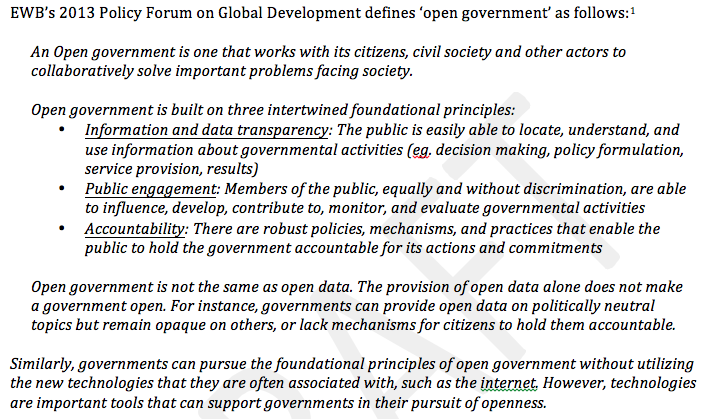 Open government should include open attitudes, open ways of being, not only open data and use of technology. It should be inclusive and seek to engage those who do not normally participate, as well as those who are already active. It should go further than data about public services and also encompass those aspects that may be uncomfortable and politically charged. Opening data is only a first step – and there are still big gaps. 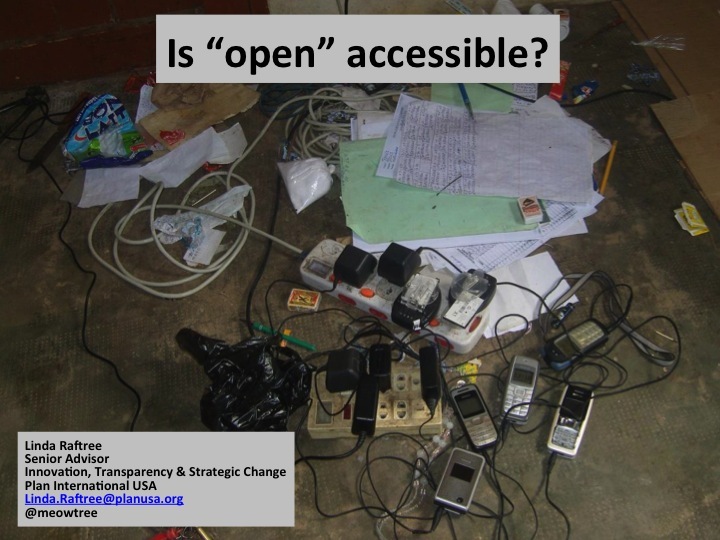 ‘Open’ does not automatically mean accessible, useful, relevant or accountable. Although new ICTs offer huge potential, focusing too much on technologies and data can marginalize a range of voices from the current discussion about (and implementation of) open government initiatives and processes. Much about these processes is currently top down and focused at the international and national levels, or sometimes district level. Community level data would be a huge step towards local accountability work. Government responsiveness matters. A lot. So when working in open government we need to ensure that if there are ways to input and report, that there is also responsiveness, willingness on government side and the right attitude(s) or it will not succeed. Open Data/Open Government portals are not enough. I’ve heard that donors know more about the open government portal in Kenya than Kenyan NGOs, Kenyan media and Kenyan citizens. It’s important to work with skilled intermediaries, infomediaries and civil society organizations who have a transparency mandate to achieve bigger picture, social motivation, large-scale awareness and education, and help create demand from public. But these intermediaries need to strive to be as objective and unbiased as possible. If there is no response to citizen demand, the initiative is sunk. You may either go back to nothing, increase apathy, or find people using less peaceful approaches. Great tech examples exist! But…. 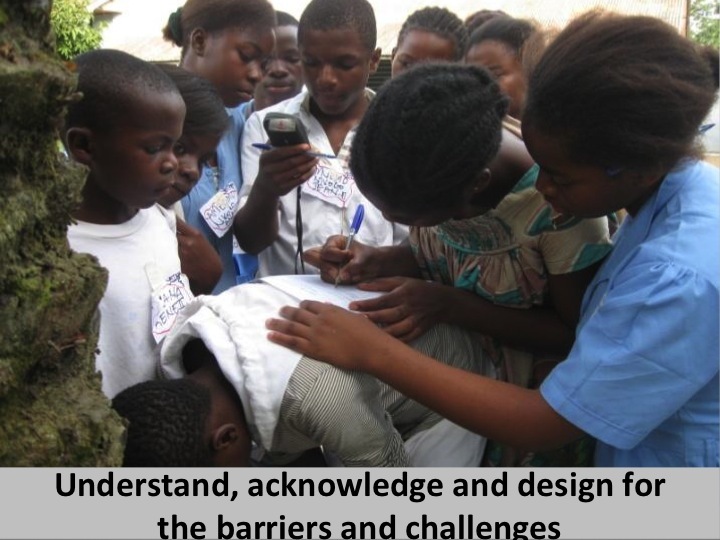 how to learn from them, adapt them or combine them to address the aforementioned barriers? Initiatives like Huduma, U-Report, I Paid a Bribe have gotten great press. We heard from Ugandan colleagues at the Open Knowledge Festival that people will use SMS and pay for it when the information they get is relevant; but we still need to think about who is being left out or marginalized and how to engage them. We need to also consider age-old (well, 1970s) communication for development (C4D) and ‘educación popular’ approaches. New ICT tools can be added to these in some cases as well. For example, integrating SMS or call-in options make it possible for radio stations to interact more dynamically with listeners. Tools like FrontlineSMS Radio allow tracking, measuring and visualization of listener feedback. The development of ‘critical consciousness’ and critical thinking should be a key part of these processes. Existing successful social accountability tools, like community scorecards, participatory budget advocacy, social audits, participatory video, participatory theater and community mapping have all been used successfully in accountability and governance work and may be more appropriate tools in some cases than Internet and mobile apps to generate citizen engagement around open data. Combining new ICTs with these well-established approaches can help take open data offline and bring community knowledge and opinions online, so that open data is not strictly a top-down thing and so that community knowledge and processes can be aggregated, added to or connected back to open data sets and more widely shared via the Internet (keeping in mind a community’s right also to not have their data shared). A smart combination of information and communication tools – whether Internet, mobile apps, posters, print media, murals, song, drama, face-to-face, radio, video, comics, community bulletin boards, open community fora or others – and a bottom-up, consultative, ‘educación popular’ approach to open data could help open data reach a wider group of citizens and equip them not only with information but with a variety of channels through which to participate more broadly in the definition of the right questions to ask and a wider skill set to use open data to question power and push for more accountability and positive social change. Involved and engaged media or “data journalists” can help to bring information to the public and stimulate a culture of more transparency and accountability. Responsiveness and engagement of government and opportunities for open dialogue and discussion among various actors in a society are also key. Community organizing will remain a core aspect of successful civic participation and accountability efforts. Morning panels covered some examples of open government initiatives from Finland, Ghana and Canada. In the afternoon we heard about some of the challenges with open data, open government and the International Aid Transparency Initiative. Table discussions followed both of the panels. The group was a mix of Canadian and African government representatives, people from organizations and groups working in different countries on open government and open data initiatives, and young people who are connected with EWB. The session was under Chatham House Rule in order to encourage frank conversation. Drawing from such documents as the Open Government Partnership’s Open Government Declaration, Harlan Yu and David G. Robinson’s “The New Ambiguity of “Open Government,” Beth Noveck’s What’s in a Name? Open Gov and Good Gov and Nathaniel Heller, A Working Definition of ‘Open Government’, the following definition of Open Government was used to frame the discussions. 1. Participation thresholds need to be as low as possible for people to participate and engage in open government or open data initiatives. You need to understand well what engagement tools are most useful or comfortable for different groups. In some places, to engage the public you can use tools such as etherpad, wiki platforms, google docs, open tools and online collaboration spaces. In other places and with other populations, regardless of what country, you may be more successful with face-to-face methods or with traditional media like television and radio, but these need to be enhanced with different types of feedback methods like phone calls or surveys or going house to house so that your information is not only traveling one way. Community organizing skills are key to this work, regardless of whether the tools are digital or not. 2. Literacy remains a huge challenge hindering access to information and citizen engagement in holding government accountable in many countries. This is why face-to-face engagement is important, as well as radio and more popular or broad-based communication channels. One participant asked “how can you make open government a rural, rather than an urban only, phenomenon?” This question resonated for participants from all countries. 3. Language is still a critical issue. Language poses a big challenge for these kinds of initiatives, from the grassroots level to the global level, within and among countries, for citizens, governments, and anyone trying to share or collect data or information. It was noted that all the countries who have published data to IATI are publishing in English. All the IATI Standards are in English, as is the entire support system for IATI. As one participant noted, this begs the question of who the information in IATI is actually designed for and serving, and who are the expected users of it. Open data initiatives should consider the implications of language they publish in, both politically and practically. 4. Open data can serve to empower the already empowered. As one speaker noted, “the idea that everyone has the potential to make use of open data is simply not true.” Access to digital infrastructure and educational resource may be missing, meaning that many do not have the ability to access, interpret or use data for their own purposes. Governments can also manipulate data and selectively release data that serves their own interests. Some questioned government motives, citing the example of a government that released “data” saying its unemployment rate was 10% when “everyone knew this to be false, and people grumbled but we did not feel empowered to challenge that statement.” Concern was expressed over the lack of an independent body or commission in some countries to oversee open data and open government processes. Some did not trust the government bodies who were currently in charge of collecting and opening information, saying that due to politics, they would never release any information that made their party or their government look bad. 5. Privacy rights can be exploited if data is opened without data protection laws and effort to build capacity around how to make certain data anonymous. Citizens may also not be aware of what rights are being violated, so this should also be addressed. 7. Open data needs to become open data 2.0. 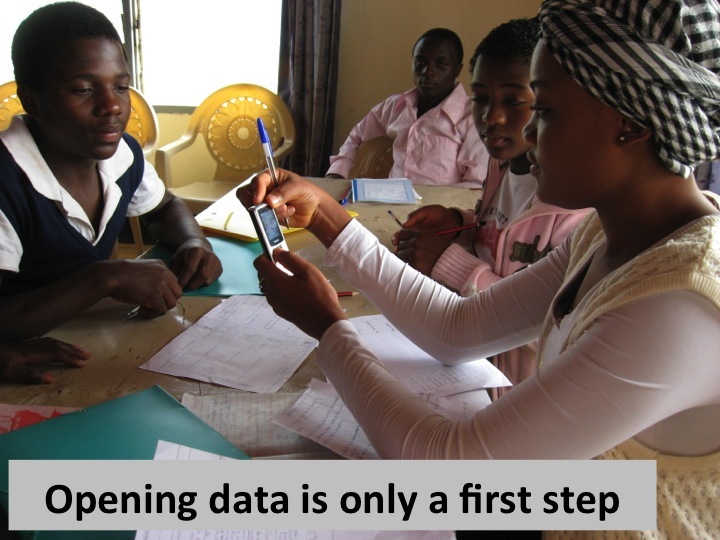 According to one participant, open data is still mostly one-way information delivery. In some cases there isn’t even any delivery – information is opened on a portal but no one knows it’s there or what it refers to or why it would be useful. When will open data, open government and open aid become more of a dialogue? When will data be released that answers questions that citizens have rather than the government deciding what it will release? The importance of working with community groups to strengthen their capacity to ask questions and build critical consciousness to question the data was emphasized. A counter point was that government is not necessarily there to start collecting information or creating data sets according to public demand. Governments collect certain data to help them function. 10. Technological platforms are modifying how political parties and democratic processes operate. This may or may not be a good thing. Normally priorities arise and are discussed within political parties. Will people now bypass the party process and use ‘direct democracy’ channels if they are passionate about an issue but do not want to enter into negotiation around it? Will this weaken political processes or longer standing democratic processes? One speaker considered this change to be positive. People are not happy with being able to vote every 4 years and they want opportunities to participate in between elections cycles and direct voice in how priorities are decided. Others questioned whether bypassing official processes can lead to less participation and more apathy overall on national issues. Some questioned whether within fairly long-standing democracies, open data will have any real impact, considering existing levels of apathy and the lack of political participation. 11. Strong information, statistical, monitoring and evaluation systems are critical for open data and open government processes and to ensure more effective management of development results. This is still a challenge for some countries that need to review their mechanisms and improve their tools and processes for data collection and dissemination. If there is no data, or no current data, there is not much point in opening it. In addition, there are capacity and technical competency challenges within institutions in some countries. One participant mentioned a lack of current government geological information about gold and oil deposits that weakens government capacity to negotiate with the private sector extraction industry and ensure partnerships and earnings will contribute to national development. In addition more evidence is needed on the impact, use, and outcomes of open data. At the moment it’s quite difficult to say with any real authority what the outcomes and impact of open data and open government have been. 12. 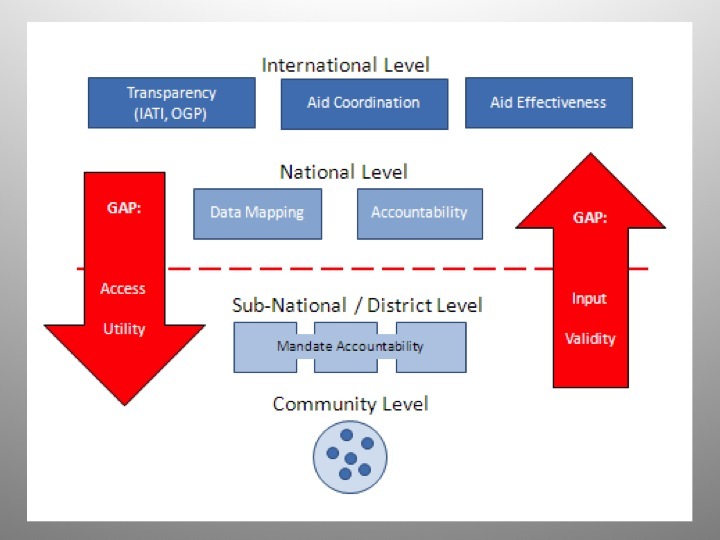 IATI (International Aid Transparency Initiative) needs more partners. Government representatives noted that they are opening their data, but they can only open the data they possess. In order for data on aid to be useful, more data is needed, especially that of NGOs who are implementing programs. Not many NGOs have published their information to the IATI standard at this point. “The really interesting thing will be when we can start mashing up and mapping out the different kinds of information,” as one speaker noted, “for example, this is the goal of the Open Aid Partnership. It will involve combining information from the donor, development indicators from the World Bank, and country information, and this will open up amazing possibilities once this is all geo-coded.” There are reporting challenges related to IATI and open government data, however, because at times countries and NGOs do not see the benefits of reporting – it feels like just one more top-down administrative burden. There are also issues with donor governments reporting their committed intentions and amounts, recipient governments reporting back, and communications with citizens on both sides (donor and recipient countries). One example that was reported to be enjoying some success was the multi-donor budget support initiative in Ghana, where development partners and government work together to establish development indicators and commitments. If the government delivers on the indicators, the development partners will then provide them with the funding. Development partners can also earmark funding to particular areas if there is government agreement. 13. We need more accountability towards ‘beneficiaries’.Currently many of these initiatives are perceived as being focused on donors and donor publics. As one participant noted, “the interesting thing is less about government and more about getting regular people involved in these processes. When you engage the public you’ll engage government leaders in thinking they will need to change to respond to what citizens are asking for.” Another noted that the essential issue is the link between transparency/accountability and citizens and their own governments. In addition, as one participant asked, “How can you strengthen capacity among citizens to ask the right questions about the data that’s being opened?” For example, citizens may ask about the number of schools being built, but not ask about the quality of education being provided. Public education was a strong focus of discussions around citizen engagement during the policy forum. 14. Should citizens be consulted on everything? however, was one big question. The public at large may not understand the ramifications of its own deep misunderstandings on particular issues and may be inputting from a viewpoint that lacks scientific evidence or fact. “It’s one thing to have an opinion about whether your child should be able to drink energy drinks before age 16, it’s another to input about technical programs like the best policy for green energy,” commented one group. 15. Can citizens really have greater participation if government is still in control of data? was another big question. An example was given of an open consultative process that became unwieldy for a local government, which then shut down the consultation process and changed the nature of the documents to ‘administrative’ and therefore no longer open. Others asked why governments pat themselves on the back over being part of the Open Government Partnership yet they do not have Freedom of Information Acts (FOIA) or they prosecute those who open data in alternative ways, such as Bradley Manning and Aaron Swartz. 16. If citizens don’t get a response from government (or if they don’t like the response, or feel it’s biased or manipulated), apathy and cynicism will increase. It’s important to make sure that ‘open government’ is not just a box that gets ticked off, but rather a long-term change in mentality of those in power and deeper expectations and efforts by citizens for openness and participation in conversations of national importance. The conclusion was that Open Government is somewhat of a paradox, rooted in aims that are not necessarily new. 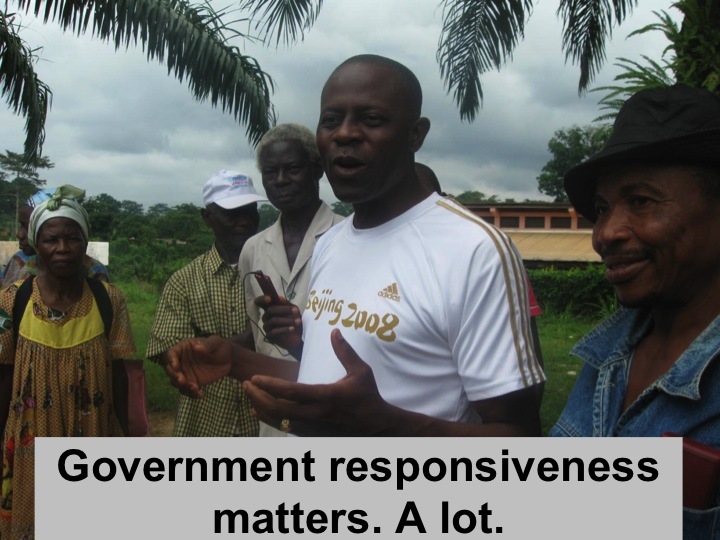 Open Government strives to enable leaders in their communities to create change and transform their lives and those of people in their communities. It is a complex process that involves many actors and multiple conflicting goals and interests. It’s also something new that we are all learning about and experimenting with, but we are very impatient to know what works and what the impact is. In the room, the feeling was one of ‘radical pragmatism,’ as one participant put it. Open Government is a big idea that represents a big change. It’s something that can transform communities at the global level and there is a great deal of hope and excitement around it. At the same time, we need to acknowledge the challenges associated with it in order to address them and move things forward. I’ll do a follow up post with the points I made during the panel as this post is clearly way too too long already. 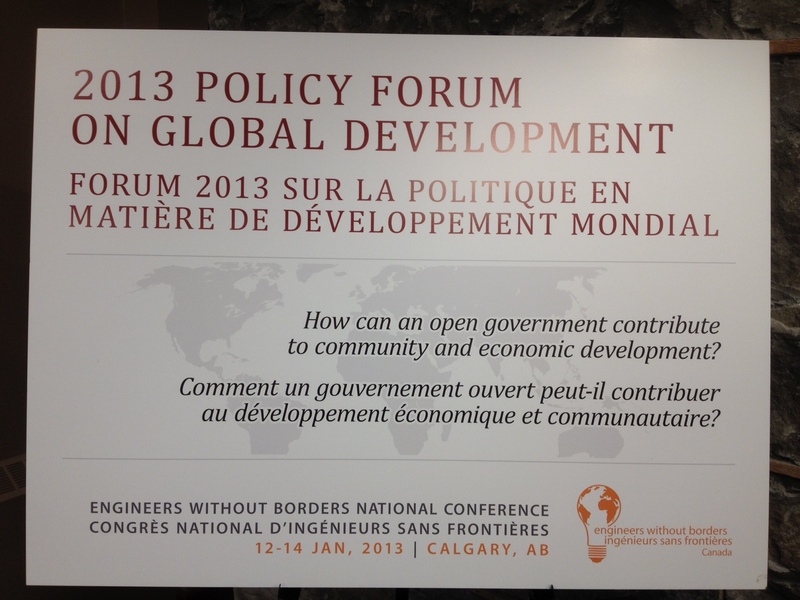 Kudos if you are still reading, and a huge thanks to the organizers and participants in the EWB policy forum.